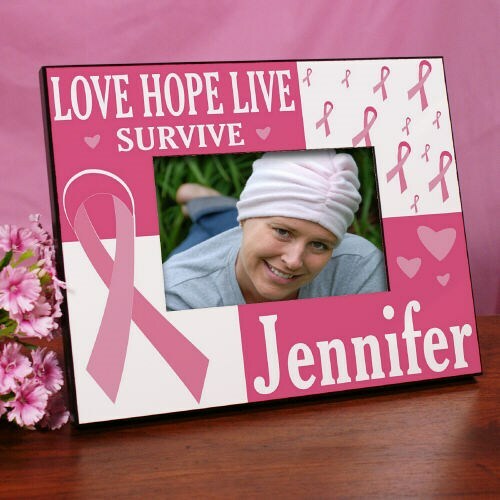 Show strength and survival with this beautifully Custom Printed Breast Cancer Picture Frame. This Personalized Love, Hope, Live, Survive Breast Cancer Frame is sure to be treasured for years to come for any survivor you know. This Personalized Breast Cancer Awareness Picture Frame makes a great gift for any survivor. Your favorite picture looks spectacular in this beautifully Personalized Picture Frame. Each personalized picture frame measures 8"x10" and holds a 3.5"x5" or 4"x6" photo. Easel back allows for desk display or ready for wall mount. Our personalized breast cancer awareness gifts can be personalized with any name at no additional cost. This frame is amazing. It allows me to show my hero.